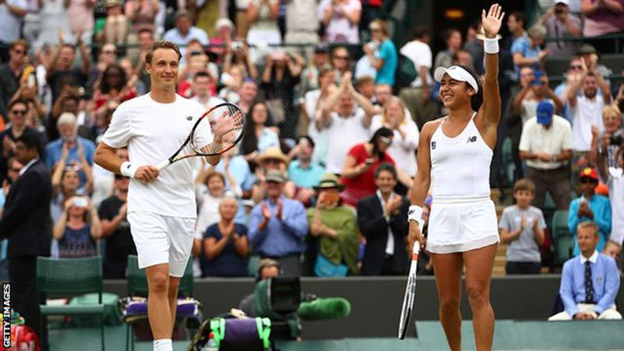 Britain's Heather Watson and partner Henri Kontinen beat Oliver Marach and Jelena Ostapenko to reach the mixed doubles final at Wimbledon. In winning 7-6 (7-1) 6-3 alongside Finland's Kontinen, Watson becomes the first British female mixed doubles finalist since Jo Durie won the event alongside Jeremy Bates in 1987. Watson, who is playing with Kontinen for the first time, said: "I'm very happy. We played so well today. I've said it a thousand times - I'm having so much fun on the court with Henri." Watson - the British number two in singles - had hoped to play alongside Kontinen, 26, at the French Open in May but was prevented from doing so because of her ranking. The 24-year-old added: "We have got the chance at Wimbledon and I'm glad we decided to play together. "We go with the flow, Henri tells me what to do, I do it and he knocks off the volleys." The pair will face 15th seeds Robert Farah and Anna-Lena Groenefeld in Sunday's final. Britain's last mixed doubles winner was Jamie Murray, who won alongside Jelena Jankovic in 2007.